Agricola Redesign | Best of Cincinnati 2019 – vote for A Village Gift Shop! There’s so much excitement going around at A Village Gift Shop. 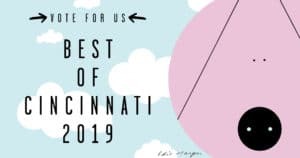 We’re excited to share that we’ve been nominated as the Best Boutique in the Northern ‘Burbs for City Beat Cincy’s Best Of Cincinnati 2019! We would be honored if you would take a minute to vote for A Village Gift Shop under “Shops & Services”. While you’re at it, vote for all your other favorite small businesses around town. You can vote once a day until February 6. You don’t have to vote in every individual category, but you must vote in at least 20 for your ballot to count. The team at A Village Gift Shop and Agricola Redesign appreciates your support.